You won’t be able to tell unless you are a participant in the wells. The surface locations are 30’ apart so the other “rat hole” is under a piece of steel that is covered up by the rig drilling the first hole. After not getting a response to my “which well” question originally, I assumed that might be the case. It’s really not a big deal, just curious. I didn’t participate in these wells so I’ll just have to wait and see. Thx Todd. GD1 - Is it possible to get a map like this that shows their plans for section 20? Thanks for any assistance! Look for the permit Form 1000 as it will usually have a map attached to it. Tim - Sorry for the delayed response. Here’s what I found for section 20 07n06w. This was an exhibit filed back in January in support of the Wilkerson wells currently being drilled from 17 into 20. Hope this is what you were looking for. Yes, GD1 that’s the one I was looking for. Thank you! The other info was also very helpful so thanks to all who responded! Continental has cases pending for 30 6N 7W & 31 6N 7W. If you have mineral rights in a section, then you should get any pending cases in the mail. You need to make sure you have your name and address and mineral rights description filed at the county courthouse. Might be a typo on my part. I looked up 7N-6W since that was at the top of the thread and it has pending cases. If you mean 30 & 31 6N-7W, then that is six miles away and already has wells, so no pending cases. Which ones do you need? We have 30 & 31 6N-7W with Unit Petroleum & Gulf Explorations, hopefully they’ll pump more. Always happy to see more drilling in the area. OK, then you do not have any new cases. I am nearby in 33. Nothing new for us at the moment. 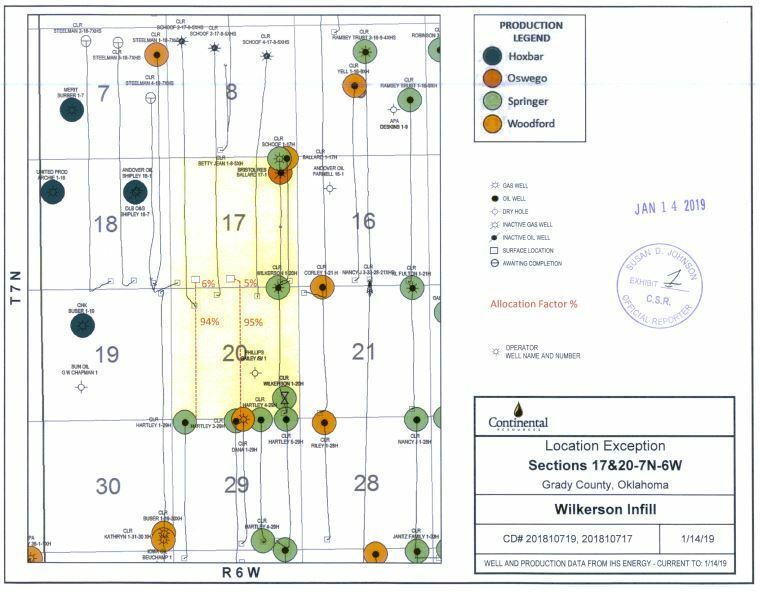 I am in Sec 6-7N-5W and Sec 7-6N-5W, where Continental has applied to the OCC to drill a new horizontal well, the Wheeler 2-6-7XHS. Do you know what the average/highest bonus is for these sections? Sec 6-7N-5W and Sec 7-6N-5W- Might be a typo there. Those are seven miles apart. Is it 7N or 6N? Guessing 6N since there is already a Wheeler 1-6XH. If you are leased in 6 already, then the first well holds the section since it was drilled to the Woodford. The Springer is shallower. If you were force pooled in 6 for the Woodford, then there might be another pooling for the Springer if not included in the first one. Not sure what a bonus might be just for the Goddard/Springer. The closest was sections 30 & 31-7N-5W in February 2018 which was for $1000 3/16, $880 1/5 and $0 1/4. While in the Chickasha area last week, I drove by to check out the activity in 31-7N6W. I was surprised to see that one of the rigs (Phelps 1-31-30-19XHS & Kathryn 2-31-6XHS) had been taken down only 6 weeks after spud. Seems way too quick for a multi-unit surface location set to drill 2 horizontal wells with a combined 4 miles of lateral. I can only speculate as to what might be going on; any insight or information or updates from others would be appreciated. GD1 I think you are incorrect. the Phelps and Kathryn rig is still on location. Those wells are the location closest to the road. These two wells are not 30 feet apart and going to be drilled from the same location (by the road)…one going north (Phelps) into section 19… and the other going south (Kathryn) going into section 6. I actually, phycially stopped and walked out to the stakes of the location and saw what they indicated before the dozer ever moved a piece of dirt. As for the rig up on the hill on the far west side that is already down. It surely has another name. I do not know of it’s name. But hope this answers your question! GD1, another rig has shown up on the west side of 31/7N6W where the 1st rig was taken down. Looks like they are drilling away. Great, thanks for the feedback. Will probably never know the story behind the rig being up for a month, then down for a month before going back up again in April but all’s well that ends well. Thx again for the feedback.